This book brings a sense of the sacred into our everyday life, and helps us to see the life we have been given through the eyes of our heart. If a book had a soul, then this book would be brimming with Spirit. Leo has a unique way of conveying deep truths using simple, yet beautiful language. His words follow a direct route from the mind to the heart, and can touch anyone, no matter where they are on their spiritual path. Even the most exalted spiritual accomplishments are unimportant if we cannot be happy in the most basic and ordinary way because the greatest lesson is that the Universal must be wedded to the Personal for us to be fulfilled in our spiritual life. With freshness and a unique blend of spiritual insight, poetry and simple life wisdom, Leo Drioli draws our attention to everyday occurences in his daily life, which gives us insights and simple techniques for attuning ourselves to the natural and dynamic inner movement of our own lives, which is the key to finding joy both within and without. An A to Z compilation of spiritual themes, the genius of this warm, inspiring book lies in its discovery of the miraculous in the mundane, and how, in our everyday life, there are many opportunities for awakening. The challenge is to recognise them. Reading this book will help you to witness every moment in your life — even those that seem filled with pain or conflict — in another way, a way that offers a sense of unity and joy, rather than separation and fear, plus a way to live a deeper, truer, more satisfying life in this world. 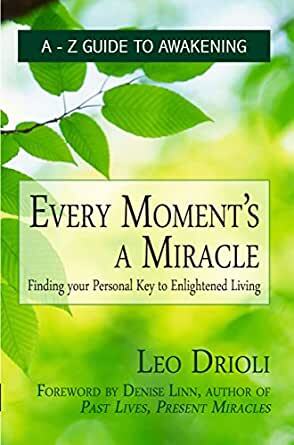 Leo Drioli has been a pioneer in the consciousness movement for over 35 years. Launching one of Australia’s first spiritual magazines, Golden Age in 1988, he is currently editor of Innerself Newspaper and also a director of the MahaShanti Foundation for Awakening.